With the focus so often on the Mississippi Delta area as the “cradle of the blues,” other places where the blues were nurtured are sometimes slighted. One such place is Atlanta, Georgia. In the years prior to World War I, its big city enticements lured many African American musicians from the Georgia countryside, as well as from other parts of the south to come seeking a better market for their art. Decatur Street, right in the heart of Atlanta’s African American community, would have rivaled New Orleans Storyville, Beale Street in Memphis, or 18th & Vine in Kansas City for its profligate night life. The piano was the instrument of choice among Atlanta’s earliest blues players that included such luminaries as Thomas Dorsey (then called Barrelhouse Tom), the albino Perryman Brothers, Speckled Red, Piano Red, and Big Maceo Merriweather. By the mid 20’s, some outstanding guitar players were making a place for themselves alongside the piano men. Among the first were Peg Leg Howell and Blind Willie McTell, soon to be followed by Curley Weaver and the Hicks Brothers, Barbecue Bob and Laughing Charlie. According to many blues historians, the most influential of all the Atlanta blues musicians was the multi-talented Eugene “Buddy” Moss. Unfortunately, like so many other exceptional blues musicians, Moss never quite made it; the breaks never came. Ill-starred circumstances, some of his own doing, robbed him of the recognition and rewards that he deserved. In 1930, Buddy Moss was only 16 years old when Barbecue Bob Hicks brought him and Curley Weaver to the Campbell Hotel in Atlanta to accompany him in a recording session. Moss played the harmonica in this trio, and they recorded as the Georgia Cotton Pickers. 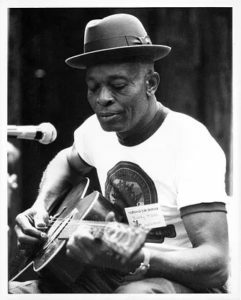 Moss’ playing was stunning and certain proof that he didn’t have to take a backseat to any of the city’s bluesmen. At the time of this session, Moss had only been in Atlanta for a couple of years, having left his home in Augusta to tried to make his way in the Georgia capital. He was already an accomplished harp player when he came to town, and under the tutelage of Barbecue Bob, whom he met soon after arriving, he became proficient on the guitar. However, his guitar playing was more like that of his idol Blind Blake, with a swinging style that used a lot of notes. Three years passed before Moss had the chance to record again; he went to New York with a group of other Atlanta musicians, including Curley Weaver, to do a session for the American Recording Company (ARC). This turned out to be a long session that lasted four days and resulted in 33 sides being cut. The first side, “Bye Bye Mama,” was Moss’s first record to be released under his own name. In that same year, ARC, which never set up a recording studio in Atlanta, called Weaver and Moss to New York to record again. These recordings, like the previous releases, were popular and sold well. Clearly ARC was impressed with the studious professionalism with which Moss approached recording, and it was only Moss that they sought out to record a few months later. By now, Moss’ singing voice, which had once been described as sounding like a grainy Leroy Carr, had lost some of its edge and had taken on a blander, smoother quality that sounded more like one of his friends and sometimes partner, Josh White. In fact, when Moss returned to New York for what was to be his last session for ARC, he was accompanied by White. Buddy Moss, at the age of 21, was on the threshold of stardom when fate intervened. In 1936, he was convicted of murder and sent to prison. In 1941, Moss was released in the custody of James Baxter (JB) Long. Long, who was in the furniture business in North Carolina, had become interested in songs that he heard song by some of his black customers. This prompted him to venture into the then-fledgling recording business, which led to his discovery of such blues artists as Brownie McGhee, Sonny Terry, Rev. Gary Davis, and Blind Willie McTell. The premier chronicler of Piedmont blues, Bruce Bastin, declares that JB Long almost single-handedly reshaped the evolution of blues in the Southeast during the half dozen years before World War II. Long’s involvement with Moss had come at the urging of Jack Satherly, Moss’ old A&R man at ARC. How he was able to spring him or the terms of the parole are not clear, but Moss spent the next 10 years working and living with Long in Elon College, North Carolina, a small town a few miles east of Greensboro. Of course, Moss became acquainted with some of Long’s protégés and, in October of 1941, went to New York with Sonny Terry and Brownie McGhee to record for Columbia Records. The cuts from this session showed that prison had in no way hampered Moss’ musical ability; if anything he had gotten better. Buddy Morris, not yet 30 years old, was optimistic about making a recording comeback, but misfortune struck once again, this time in the form of the Japanese Navy. After the bombing of Pearl Harbor, all record production virtually stopped. Only a few of the dozen or so sides from the Columbia session were ever released. Bitter and disillusioned, Moss returned to North Carolina, while McGhee and Terry stayed on in New York and became celebrities and the post-war folk music boom. Whatever Moss’ association with Long was, it seemed to be amicable, but in 1951 Moss abruptly left Elon College and returned to Atlanta. Essentially his career as a musician was over. Occasionally he would play for parties, and in the ‘60s and ‘70s he would sometimes appear at folk festivals, but he never again made a serious attempt to return to performing and recording. Buddy Moss died in Atlanta in 1984. Listen to Buddy Moss here.